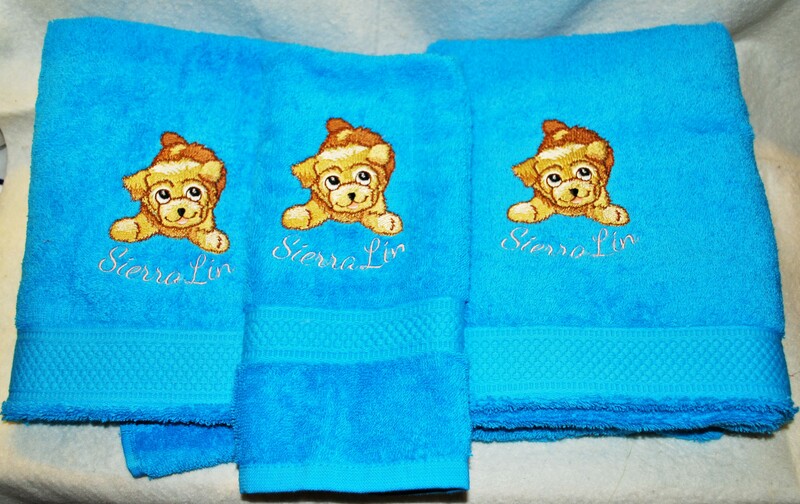 Towels in 3 sizes - guest towel 30x50 (cm,) towel 50x110 and bath towel 70x140 - for a client. The design is from CuteEmbroidery. It stitched out lovely. That's the cutest little puppy Martine. It sewed out wonderfully well. Someone is going to be well pleased. Thanks Maria, hugs to you too. Thank you. Client came up with some cartoon like licensed dog pictures, which were a no-no of course, so I showed her this design. She still had her doubts but gave the OK and when she collected them she was delighted (and paid me more than I'd asked for). Turned out just great. You can always count of a cuteembroidery design to stitch out well. Yes, I know, they do. I was afraid the shading would cause problems, but the only 'problem' was cutting the jumps - and those were cleverly sequenced, so they were not stitched over in the same colour. Just had to remove them before starting the next colour. wow, they look great !! Yes, it is. Isn't it nice to see a Cute design? They make a very nice set! Great thread choices really make the design pop, and the towel color is a great background for the designs. Love them! I used the colours that came with the colour chart of the design. And it looked great on the blue. I hope my client/friend loves them as much as I do.